I’m back from Japan, and I’ve just completed the latest pattern for Vol. 2 of the patterns ebook. This one is the izutsu-tsunagi pattern. There are a number of different patterns under the izutsu grouping (izutsu - 井筒 means well curb, the supporting structure around a well). 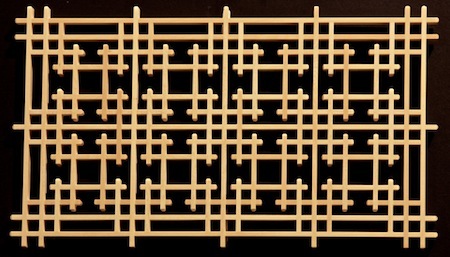 Kumiko pattern names will often vary depending on the area or person making the pattern. In my Shoji and Kumiko Design Book 1 The Basics, I referred to one of the patterns as izutsu-tsunagi. I used that as a simple generic term; I’ve seen it referred to as yotsuba izutsu-tsunagi, yotsuba izutsu-tsugi, zutsu-izutsu, and simply izutsu-tsugi, so there’s no set name for these less-commonly used patterns. To simplify everything, the pattern below is the one I’ll refer to as izutsu-tsunagi, and the one in Book 1 The Basics I’ll now refer to as yotsuba izutsu-tsugi. It may be a little confusing, but hey, that’s part of the fun of kumiko patterns. 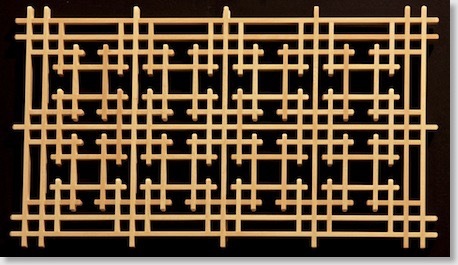 This pattern is fairly straightforward, but with the large number of joints very closely spaced, it is quite time-consuming, and accuracy is critical. This pattern would look stunning in a ranma, either by itself or in conjunction with another pattern, or as a bottom base pattern for a shoji.